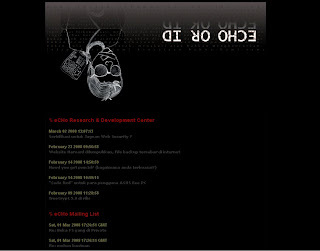 This week, Im collaborating with az001 to rebuild echo.or.id homepage, Az develop the code (thx to the_day for creating rss for echo`s forum) and i just made the whole design. The basic idea is giving the whole echo community door through the first page (for now, only cover e-rdc security news/journal, echo forum and echo mailing list at !yahoogroups). You can see the screenshot below, or just go to echo portal. After 2 hour designing the page and publish the page, i realize that e-rdc Rss was not fully supported by rss parser that Az develop (also for rss reader like Newsfox, probably general for all rss reader), after "hacking" php-fusion code for a while i patch the RSS file to support "timestamp" that generally used by rss parser. and, then the date will perfectly being parsed and display.